Hummus-Stuffed Cherry Tomatoes, Quick Vegan Hummus Caprese - Two Easy Recipes For Your Garden Tomatoes! for a quick and easy appetizer! If you have a cherry tomato plant in your garden you are probably buried in these little fruits. Besides popping them in your mouth or tossing them in a salad, here's a quick and easy way to turn them into a tasty appetizer. Start with large cherry tomatoes - the real tiny ones are not good candidates for this. If you are in a hurry, buy some ready-made hummus in the grocery store. Hummus is very easy to make but it's even easier to buy. So if you have some last minute guests and a bunch of cherry tomatoes, pick up a tub. I've seen some very interesting flavors too. Whole foods has their own brand that's very well priced (less than $3.00) and comes in several flavors including lemon, garlic, red pepper, olive, and traditional. Get a brand that is firm so it holds up in the pastry bag. Cut the tops off of the cherry tomatoes and hollow them out. I gently dislodge the seed cluster with a tomato knife and then scoop the seeds out with a tiny spoon. Remove all the moisture. Place the hummus in a pastry bag with a pretty large tip so that the hummus will flow through it easily. Fill each cherry tomato. Fill the cherry tomatoes with hummus using a pastry bag. If you really want to get fancy, you can serve them on their tops! Warning: It's a bit tricky to get them to stay on. If you're lactose intolerant like me you have to avoid mozzarella, the main ingredient of Tomato Caprese salad. But there are several ways to still enjoy this wonderful Italian dish. You can substitute a spoonful of firm hummus for each slice of mozzarella. Just slice the top and bottom from a nice heirloom tomato and cut the rest of the tomato into 3 thick slices. Use one tomato, 3 heaping tablespoons of hummus, some chopped fresh basil, 1 teaspoon of hemp or olive oil, and some freshly ground black pepper for each serving. Build the Caprese salad by placing one slice of tomato on a small plate. Place a heaping tablespoon of hummus over the tomato slice, then another tomato slice, another layer of hummus, a final tomato slice, and a final layer of hummus. Sprinkle some chopped fresh basil and freshly ground black pepper over the tomatoes and drizzle a teaspoon of cold-pressed hemp oil or extra virgin olive oil over each salad. Serve immediately. To make a vegan caprese that tastes more like cheese, see my recipe for Raw Vegan Caprese Salad that uses a simple cashew "cheese" to replace the mozzarella. 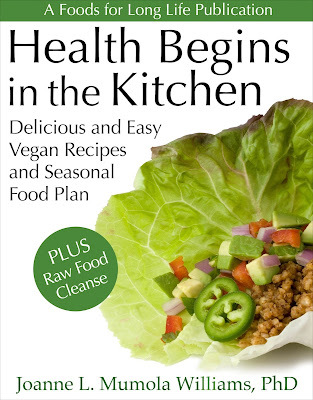 If you enjoyed these ideas, check out my eBook, Health Begins in the Kitchen! that I had not yet asked myself. What motivated me to leave a successful high tech career to pursue a Ph.D. in holistic nutrition? Making the transition, what challenges did I face? 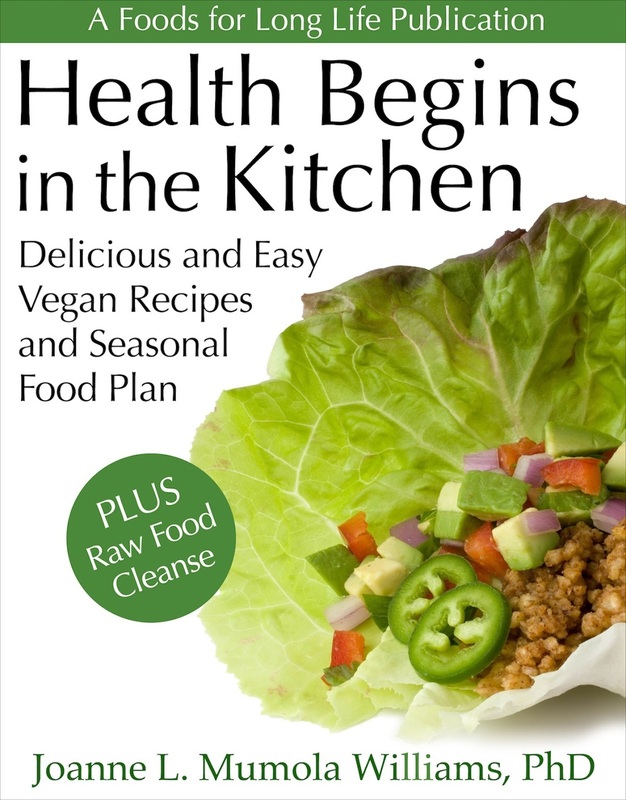 To what degree did my blog, Foods for Long Life influence my decision to write and publish this book? Summarize the book's journey from idea to finished product. How did I decide an e-Book was the right format? What cookbook features matter to me most and why? 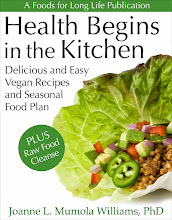 What recipes from Health Begins in the Kitchen am I most excited for my readers to try? To read the interview in its entirety, go to Lisa's blog, Baking with Lisa. The EPA Takes A Small Step To Protect Honey Bees - Should They Do More? Here's What You Can Do! A local honeybee enjoys a calendula in my organic garden. Colony collapse disorder (CCD) describes the drastic decline of honey bees. Although honeybee populations have had mysterious declines throughout history, recent dramatic declines have been alarming. Between 2012 and 2013, U.S. beekeepers lost 45 percent of their colonies. Scientists fear that this could lead to widespread crop failure in the very near future. I must admit, I didn't think much about honeybees while growing up in New York City. Most city people classify insects as annoying "bugs". Now that we living in a farming community, my views have certainly changed. But bee populations effect everyone. They are responsible for pollinating $15 billion dollars of crops - about one third of the food we eat, like certain berries, fruits, tree nuts, and vegetables. Here's an example. 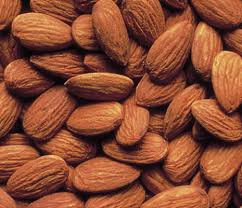 Did you ever wonder why almonds are so expensive? Well, they are completely dependent on honeybees for pollination. In fact they use 60 percent of all managed honey bee colonies in the United States or 1.4 million colonies of honeybees! Colony collapse disorder has severely affected the almond industry. So if you enjoy eating almonds, putting almond milk on your cereal, or eating almond butter sandwiches, you should care about honey bees. Other crops that require honeybee pollination include apples, oranges, lemons, limes, broccoli, onions, blueberries, cherries, cranberries, cucumbers, cantaloupes, carrots, and avocados, to name just a few. What Causes Colony Collapse Disorder? * Pathogens: Several pathogens have been linked to CCD. Nosema (a gut fungi) and Israeli Acute Paralysis Virus are two candidates although no one single pathogen has been found to cause the majority of CCD incidents. * Parasites: Varroa mites have been identified in many of the affected honeybee colonies. It is not known if these mites contribute to CCD or if they are merely acting as a carrier of a pathogen. * Management stressors: Yes, bees can be stressed out too! Because of local scarcity, bees are transported to locations throughout the country to pollinate crops. This, in addition to apiary overcrowding, creates stress for the bees. * Environmental stressors: These can include poor nutrition due to the scarcity or lack of diversity of nectar and pollen and limited access to good, uncontaminated water. But the big spotlight, most recently, has been on their exposure to insecticides. Insecticides - A Big Problem! One particular class of pesticides, neonicotinoids, which include chothianidin, thiamethoxam, and imidacloprid, have been accused of causing CCD. More than 30 separate scientific studies linking neonicotinoids to falling bee populations prompted the European union to vote to ban the use of these pesticides. Recently in a Portland suburb, the Daily Beast reported that more than 50,000 bumblebees died in a Target parking lot after being exposed to trees that were treated with neonicotinoids. Unlike the EU, the EPA took a much smaller action to address the toxic effect of these chemicals on bees. Rather than banning these pesticides, the EPA has developed new labels to warn users that some pesticides may kill honeybees (can you hear me yawning?) Yes, we know how few people read labels and, even if they did, wouldn't hesitate to use a product that they've grown familiar with just because it says that it "can kill bees and other insect pollinators." If they cared that much, they would already have an organic garden and wouldn't think of using these toxic chemicals to grow their food. 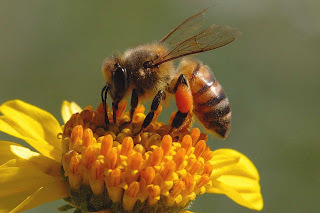 Representative Earl Blumenauer of Oregon and Representative John Conyers of Detroit introduced a bill to put a temporary ban on all suspect insecticides until the EPA thoroughly understands pesticides' true effect on pollinators. It's no surprise that the GMO manufacturers (whose seeds were develop to withstand these toxic chemicals) are against this measure. And I'm sure the chemical companies who manufacture the pesticides are lining up. Earl Blumenauer and John Conyers asks that everyone contact their representative and encourage them to include the "Save America's pollinators Act" in the Farm Bill. Are you shopping for bee-friendly plants like sunflowers for your garden? A report from the Earth and the Pesticide Research Institute claims that some garden plants sold at Home Depot, Lowe's, and other garden centers have already been pre-treated with these bee-killing pesticides! Here's a list of products that contain neonicotinoids. To avoid killing bees, the Center for Food Safety recommends you avoid these common home and garden products. Is Organic Farming the Answer? It's difficult to farm organically. I know that firsthand. My husband and I are one of the very few organic vineyards in Sonoma county (only 3 percent of the roughly 1,800 vineyards in Sonoma county are organic). It's a constant struggle fighting weeds, mildew and other problems that arise. Organic solutions to these issues are also more expensive. But in the end, it's worth it. Even though wine grapes don't require pollination, our land is just buzzing with bees! They like it here. They know our flowers and vegetable gardens are safe to buzz around because they are free of these horrible chemicals. So when you are selecting seeds or plants for your garden or buying fruits and vegetables in the store, select organic when you can. It encourages organic agricultural practices which is not only good for your health and the health of the planet, but it's good for the bees! Miso And Ginger Glazed Eggplant - Vegan And Gluten Free! When in a Japanese restaurant, I always order miso soup or have something that's been glazed with miso. But to be honest, I haven't cooked a lot with it at home. 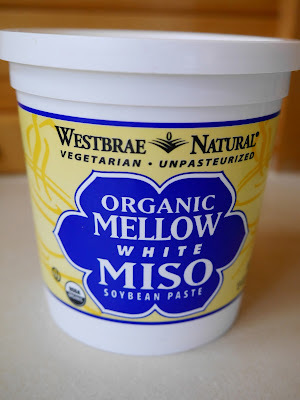 But this week I've been experimenting quite a bit with miso. Yesterday I failed to recreate a good miso soup but made a pretty good miso-tahini dressing (I'll blog that in the future when I perfect it). Today for lunch I used miso, in combination with grated ginger, to glaze and then broil eggplant, and it came out great! It took less than 30 minutes so it would be a pretty easy appetizer or side dish when entertaining. Although most people sprinkle sesame seeds on this dish, I use raw hemp seeds to get a bit of omega-3 into the recipe. Preheat the oven to 425 degrees F. Lightly grease roasting pan with olive oil or olive oil spray. Slice eggplant in half lengthwise and place in the roasting pan. Spray the top of eggplant with olive oil. Place eggplant in the oven and roast until they soften, about 15 minutes. Spray oil is a way of using much less oil on eggplant, a vegetable known for absorbing large amounts of it. Sesame oil is used for the miso glaze. While the eggplant is roasting, make the glaze by combining miso, ginger, sesame oil, soy sauce, vinegar, and cane sugar in a small bowl. If it's too thick to spread, add a tablespoon of water. Set aside. Westbrae white miso is made with cultured organic white rice, organic whole soybeans, water, and sea salt. Remove the eggplant from the oven. Spread miso glaze uniformly over the eggplant. Sprinkle with freshly ground black pepper to taste. Spread glaze over the eggplant. Carefully, wearing oven mitts, raise the oven rack to about 5 inches from the broiling element. Place the miso-glazed eggplant under the broiler and broil until brown and bubbly, about 4 to 6 minutes. Watch carefully so it doesn't char. Remove from the oven, sprinkle the eggplant with hemp seeds and scallions, and serve immediately. Sprinkle with hemp seeds and scallions. Per serving: 117 calories, 5 g total fat, 0.6 g saturated fat, 356 mg omega-3 and 2,136 g omega-6 essential fatty acids, 5 g protein, 16 g carbohydrates, 7 g dietary fiber, and 762 mg sodium. 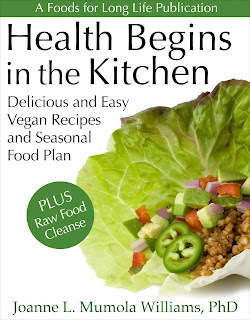 Check out my ebook, Health Begins in the Kitchen! Seeds and nuts boost saffron rice's flavor and nutrition. My grandson loves saffron rice. Recently, during his visit, he suggested our entire dinner be a huge platter of saffron rice and nothing else! Well it wasn't the entire meal, but I did make it for him a few times. I found that I too love rice that has been infused with this lovely and rare spice. And rice is the perfect grain for those who are searching for gluten-free foods. OK, I admit it. I prefer the dish with white, jasmine or basmati rice. It's lighter and fluffier. But it has more fiber and nutrients when made with whole grain, brown rice. It also has a nice, chewy texture. And there are a few other things you can do to step up the health benefits of this classic dish. * Add some turmeric (a spice with amazing anti-inflammatory properties). * Add lots of onions ( I use a whole cup in this recipe). A member of the Allium family, they are packed with health-promoting sulfur-containing compounds. * Avoid butter when sautéing the onions. Earth balance is a good substitute for butter but extra virgin olive oil is an even better selection. 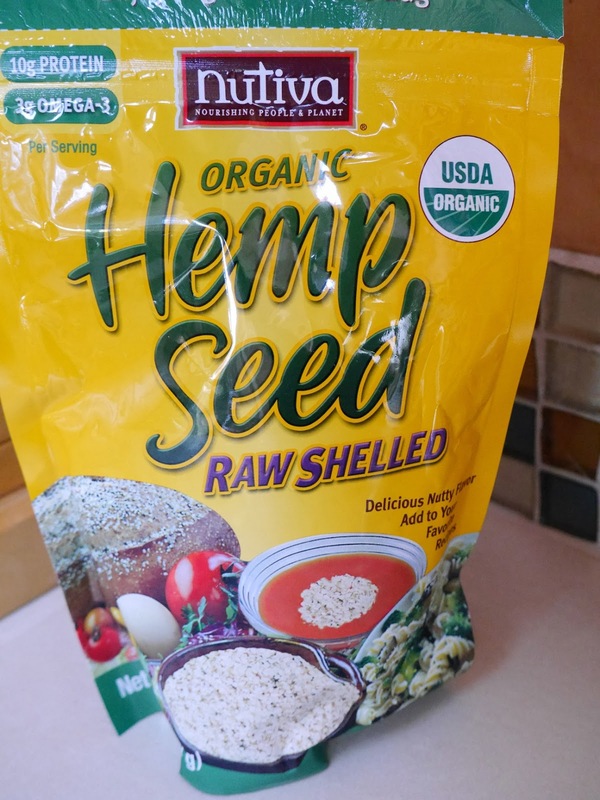 * For additional vitamins, minerals, and essential fatty acids, stir in some hemp seeds, sesame seeds, and slivered almonds. I couldn't live without Rapunzel Vegetable Bouillon with Sea Salt and Herbs. Whenever I need a flavorful broth, I pop one of these in some water. One large cube (2 servings) contains 2,020 mg of sodium so if you use this, there is generally no need to add additional salt as it contains the equivalent of 7/8 of a teaspoon of salt. Use only half of a cube if you are restricting your intake of sodium. One of the ingredients is yeast extract so I did a bit of research on whether or not they were gluten free. According to the moderator of celiac.com, yeast and yeast extract are gluten free. The manufacturer, according to veganessentials.com, states, "There is no added gluten to our Bouillons however they are processed on the same lines and in the same facility as products containing gluten. We are unable to guarantee that this product is gluten free." So if you have celiac, you are better off using a "certified gluten-free bouillon or broth". * Water and bouillon can be replaced with 2 cups vegetable broth and salt to taste. Place the water in a small pot and bring to a boil. Turn off the heat and mix in the bouillon cube to make broth. Set aside. Crush the saffron threads and add to the hot broth along with the turmeric. Add crushed saffron and turmeric to hot broth. Heat the oil or Earth Balance in a large Dutch oven or pot with a tight fitting lid. Add the onions and cook on medium low heat until the onions soften, about 5 minutes. Stir in the rice and saffron-infused broth and bring to a boil. Cover, reduce the heat, and cook until all the liquids have been absorbed (15 to 20 minutes for white rice and 45 to 50 minutes for brown rice). Do not open the lid during the cooking process until it is time to check for doneness. Add rice and saffron-infused broth to pot, cover and cook. Stir hemp seeds, sesame seeds, and almonds into the rice and serve. For plain saffron rice, these may be omitted. Per serving (using white rice and olive oil): 263 calories, 8 g total fat, 2 g saturated fat, 299 mg omega-3 and 1,794 mg omega-6 fatty acids, 0 mg cholesterol, 5 g protein, 42 g carbohydrates, 2 g dietary fiber and 510 mg sodium. Per serving (using brown rice and olive oil): 265 calories, 9 g total fat, 2 g saturated fat, 305 mg omega-3 and 2,189 mg omega-6 fatty acids, 0 mg cholesterol, 6 g protein, 40 g carbohydrates, 3 g dietary fiber and 511 mg sodium. No-cook tomato sauce on gluten-free brown rice noodles. Is your garden loaded with ripe tomatoes? Are you looking for ways to enjoy them? Here's a quick and easy no-cook sauce that you can prepare in less than 30 minutes. And don't leave out the oil! Good fats, when eaten with foods that contain lycopene (like tomatoes), have been shown to increase serum lycopene levels. Increased lycopene levels have been linked to reduced risk of coronary artery disease. That makes sense since lycopene is fat-souble. 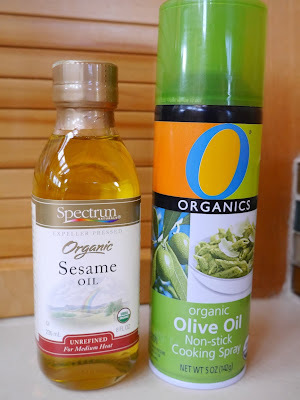 I use a little cold-pressed hemp oil in this recipe for the beneficial omega-3 fatty acid. Hemp oil should never be heated on high temperatures as it will destroy the omega-3. You can also use extra virgin olive oil, especially if you plan to put it over direct heat. I typically use this sauce at room temperature and toss it in with hot pasta. Tomatoes are rich in lycopene, a carotenoid associated with lowering the risk of coronary artery disease. Fill a small pot of water and bring to a boil. Wash the tomatoes. Cut out the stems and score an x on the bottom of each tomato. Tomatoes with stems cut out and bottoms scored. Drop the tomatoes in boiling water for 1 minutes to loosen their skins. Parboiling helps loosen their skins. Gently remove the tomatoes with a slotted spoon and place in a colander to cool. When they are cool to touch, remove their skins. Cut the tomatoes in half horizontally. Holding each half in your hand, over a sink, squeeze out the seeds and some of the juice. Tomato halves after seeds are removed. Chop the tomatoes and place them in a bowl with basil, garlic, oil, salt, and pepper. Chopped tomatoes, garlic, basil, oil, salt and pepper. Toss the room-temperature sauce with hot pasta or pour over hot polenta and serve. Nutritional information: Note that the hemp oil provides more essential fatty acids than the olive oil. Per one half cup of sauce (with hemp oil): 70 calories, 5 g total fat, 0.3 g saturated fat, 677 mg omega-3 and 2,792 mg omega-6 fatty acids, 0 mg cholesterol, 1 g protein, 7 g carbohydrates, 2 g dietary fiber, and 202 mg sodium. Per one half cup of sauce (with extra virgin olive oil): 70 calories, 5 g total fat, 0.6 g saturated fat, 45 mg omega-3 and 565 mg omega-6 fatty acids, 0 mg cholesterol, 1 g protein, 7 g carbohydrates, 2 g dietary fiber, and 202 mg sodium.